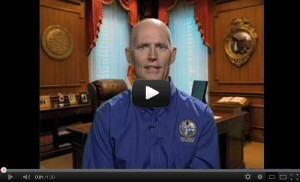 Hi, this is Governor Rick Scott. This week I led an economic development mission to the United Kingdom to take part in one of the world’s largest international air shows. The Farnborough Air Show brings together more than 120,000 leaders from 40 countries in the aerospace, defense and space sectors. We were there to demonstrate Florida’s competitive advantages as the epicenter of the aerospace and aviation industries. With twelve aviation military installations, three spaceports and dozens of academic institutions, Florida also offers a top-rated workforce with unbelievable expertise. During our four days in the United Kingdom, we met with leading CEOs and told them why Florida is the premier place to start, relocate or expand a business.